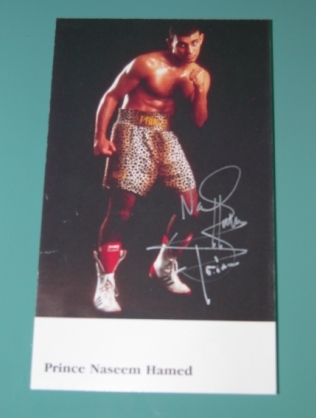 Prince Naseem Boxing World Champion signed photo. born to Yemeni parents who emigrated to Sheffield. Hamed styled himself as Prince Naseem Hamed. Hamed is known for his flashy and sometimes arrogant style, colourful ring entrances and unorthodox southpaw style. style walk way, and walking into the ring with a Halloween mask for his fight with McCullough (fought on Halloween night of 1998). Hamed is part of the 2015 class for the International Boxing Hall of Fame.